I am currently doing some turning between centres and to stop the vibration have had to put the tail stock closer than is ideal to the job. A travelling steady would be great but my cross slide does not seem to have any mounts for one. Anyway I thought what if there was a steady that could A) just be clamped into the tool post or B) replace the tool post so it would need to have the facility to mount the tool you needed into it. The most obvious problem would be that with every cut you would be moving the top steady off the centre of the work but to get over that you could have it so you set it up and leave it there then the tool could move back and forward with a screw in the steady. If no one is interested in taking this up as a project I will store it as a future project but I have put it here in case anyone fancies giving it a go. I don't recall what breed your lathe is. But in my case, with a Seig C2 clone (7x12") there are two mounting holes in the head stock side of the cross slide where my non existent traveling steady would mount. Did not get any steadies at all with my lathe and so far have not got around to making any. So have a look see, you may discover something helpful. Or Not? The two holes should be in the front of the saddle, it should not move in and out with the slide. Silly question: - Are you using a quick mount tool holder? Have you considered mounting the tool holder on the right hand side of the tool post rather than the left? My lathe is a old Harrison 14" and it doesn't have anything at all on the cross slide to mount a steady. However I am managing without one I posted because I thought it may be a idea someone would want to look in to. You are absolutely correct Jo. They are on the Saddle. Brain fade? Or, type without thinking? I have seen pictures of tool post mounted steady, that had brass or broze ring that provided bearing surface for slender rod to pass trough, different ring for different stock diameter. traditional finger aragement might not work for very small work. There was also a HSS tool bit set (with set screws if I remember correctly) to size the this slender rod to certain diameter. I belive clock makers use it. The big idea was not to use lathe slides to set the cutting depth, but move the tool bit within the tool holder. Only reference I could find was a bit different...hope this picture shows to you. The steady went over the cross slide http://www.lathes.co.uk/harrison/page9.html , and had to be fitted dead square or it stuck , iff you didn't know what the stready looked like you wood wonder weare it fitted . Pekka, I think the phrase you are looking for is box tools. A Bing/Google image search for "lathe box tools" shows lots of examples. ME in 1940's ran a whole series of articles on making/using these as well. Eactly.Thank you very much. Saw picture of one very much like that picture. How those work on real life? 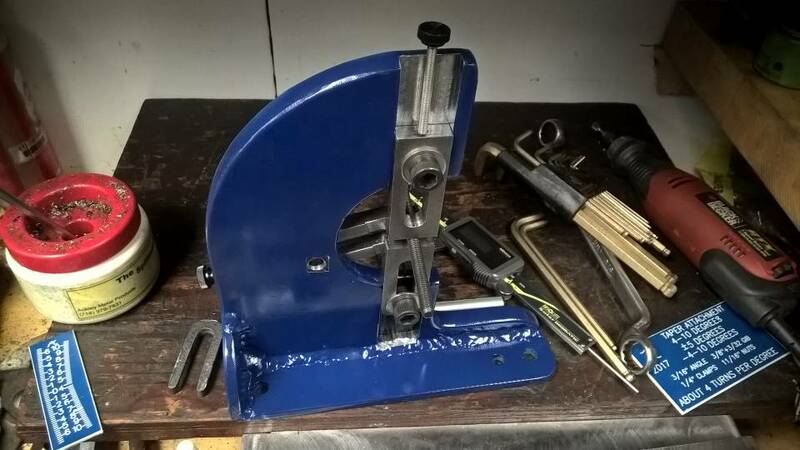 I haven't personally tried one yet but the setup is to pick a bushing that fits closely on the raw stock, the cutting tool is to the right of that bushing. As the tool is fed to left towards the headstock, the tool cuts whatever new diameter you need. The bushing keeps the stock from wandering. This is a similar thing but from Oak and he's turning cane to size. I think I have seen other videos but cannot find the links. Still, shows that we are an inventive lot I reckon. I designed and built two follow rests for my hardinge. The first one I didn't really understand what it was supposed to do... really bodged it. 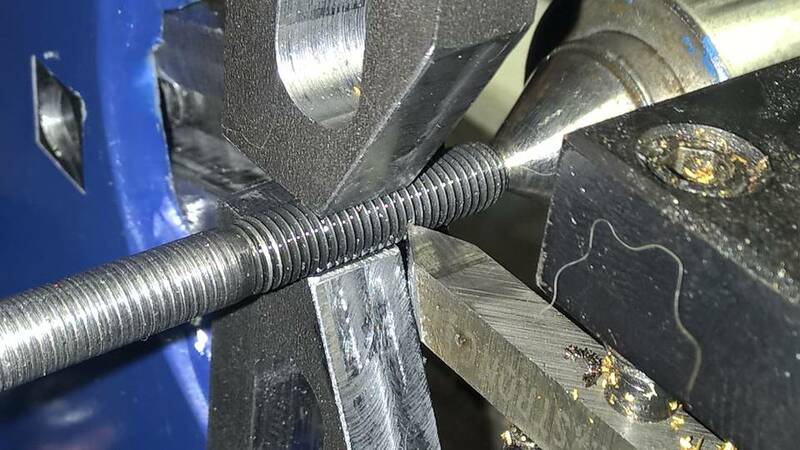 The second try rocked; I was able to extend the thread on a 1/4"-28 bolt 4" long! The three leg trap in two planes was a huge step forward. That let me completely control the work. Fyi, don't use rollers for a steady. You want the scraping/sliding action to move chips out of the way. If you want the design files, head over to thingiverse and search for "Weldingrod". You might find that an original travelling steady might not suit your needs if you use a quick change tool post anyway. I found this on my 10ee. When the lathe was made it would have used a rocker or a 4-way tool post which holds the tool nearer to the centre line of the cross slide. Because of the dovetail on the inter-changeable holders most QCTP hold the tool much more to the left - right where the steady would be - causing you to have to wind the compound right back to clear it which then loses stability and can cause you problems if you use the compound set at an angle for threading long screws. I made a steady rest for my 10ee from thick steel and made it so that it holds the fingers in line with the left side of the compound. This is a much better location if you use a modern QCTP and the ways yours is mounted would make it an easy fabrication.